Last weekend I went up north near the Canadian border for a quick overnighter. I didn't take the dogs this time and there was a 4 wheeler trail so I could get the truck close. I had two deer walk almost into camp while I was setting up. The ruffed grouse were drumming all evening and several geese and a mallard drake was my alarm clock. I enjoyed listening to coyotes during the night. I got there about three in the afternoon, hiked a little, set up camp, cooked dinner and it was time for bed. I got up cooked breakfast, drank coffee by the fire and left about 10:30. Here's a little video I strung together, some taken with my phone and some with a GoPro. Looked like a great springtime trip, Wes.....good to get out before the skeeters get too bad, too. I was trying to identify the knife you had selected for the trip and it looked like it was well-suited to the task....any clues? I think one of my grills is exactly like yours. I bought two of them from a blacksmith at a local rendezvous, many moons ago......one like yours and one with room for two seperate pans or pots. There have been many times when I used both of them at the same time, just like having a stovetop with differing burner temps. Awesome trip report. 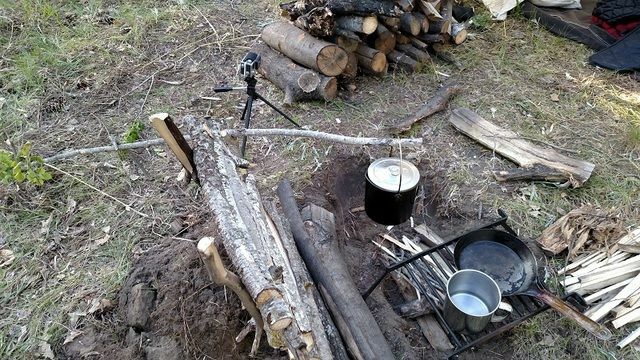 Very impressive camp setup and skills. The food looked great also. What was the weather like? I just got back from an overnighter on a River down here in Florida and it was 88* F during the day and around 65* F during the night. I didn't put in anywhere near the amount of work you put in to setup your camp. Wolfy, Thanks for looking! The knife is a TOPS B.O.B. Fieldcraft "tumble" finish blade and coyote micarts . My wife got it for me at Christmas. I like the blade shape and the handle is very comfortable. It's about the right size for fire prep and general camp chores, but the blade is a little thick for food prep at .190 or 3/16s. It really holds a great edge. I find the scraper notch on the pommel useful for striking the firesteel. The grill I got from Crazy Crow several years back. They sell a larger one, also. I have gotten a lot of use out of it, and its become one of my favorite pieces of kit. Yellowyak, Thanks for the compliment! The temps were about 50F during the day and around 40F at night, so it was the perfect time to be out. There weren't any mosquitoes, and I used permethrin and only found a couple ticks. Nice video Wes. Like Wolfy I wondered what the knife was. 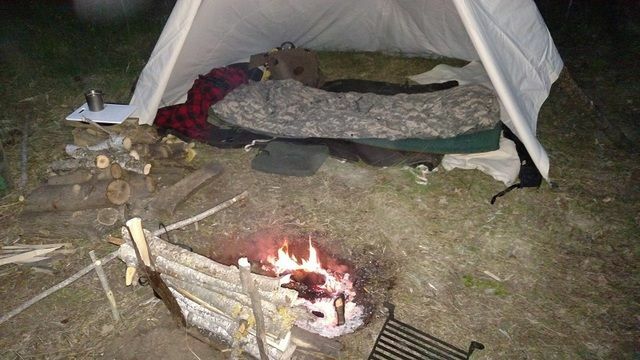 Your camp looked comfortable and the way you left it when it was over is commendable. I like the cold handled skillet... and the pistol. That's a beautiful place. Looks like great trip, nice campin' temperatures. 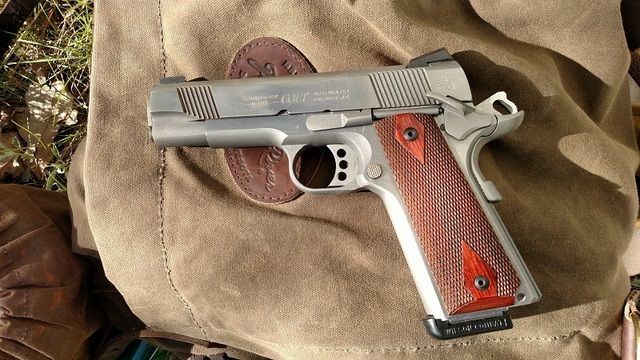 Nice gear...especially the Colt! Did you make or buy the bucksaw? Thanks for sharing your trip! Looks like you had a great time! 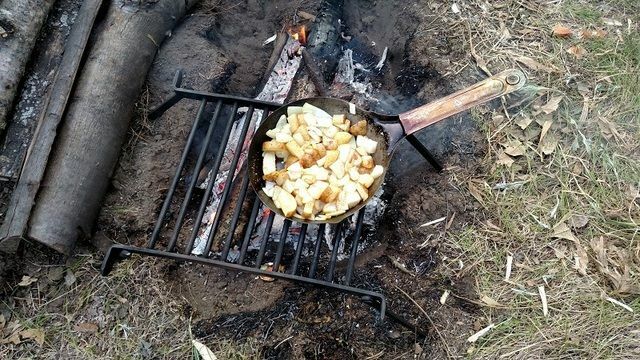 Thanks, the cold-handled skillet gets a lot of use, it's one of my favorite pieces of campfire cookware. Thanks, It was peaceful and a chance to reflect. I need that every now and then! I appreciate it, the B.O.B. Fieldcraft worked well. I don't really practice "leave to trace", but I like to leave it clean and leave as little of a trace as possible. I hate to see litter scattered all over an old campsite. Looks like a great trip. Thanks for taking us along. WMA's are a great resource. Thanks for showing us Pembina. Is your shelter 2 poles? Did you make it at home?